Synopsis: Obsessed with vengeance, a man sets out to find out why he was kidnapped and locked into solitary confinement for 20 years without reason. Review: I’m always amazed when a director with an impressive list of credits lines up a remake as their next project. Some directors, like Alfred Hitchcock, remade their OWN films and that practice still happens occasionally today with a foreign director helming an American version of the film they popularized on their home soil. Then there are the directors that take on Hollywood studio adaptations of foreign products for American audiences. For me, I get the impression that these US directors choose these foreign films to remake as a way to say “This was good but I can do it better”– though they very rarely can. If anything, they wind up creating a film that’s just as good but can exist in the same universe as their overseas counterpart as in The Girl with the Dragon Tattoo. That film was a tremendous success in Sweden and had David Fincher as a director when it jumped shores…both films are impressive and I’d watch them back to back if the spirit moved me to do so. 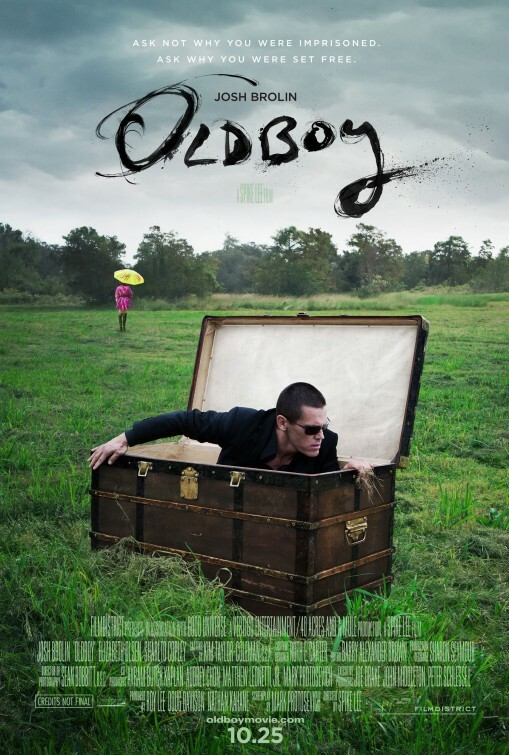 It’s strange, then, that Oldboy even happened at all. Nearly a decade old when discussions for the remake began, it’s easy I suppose to see why it attracted the attention of Hollywood and director Spike Lee. The 2003 original, Oldeuboi, had amassed a certain fervent fan base in America thanks to an impressively twisted narrative, strong performances, and skilled direction from Park Chan-wook (Stoker) which bumped it to a level of sophistication that set it apart from its more minor peers. Lee has been a troublesome director as of late, known more for his ranting outbursts toward fellow filmmakers than he was for making some important films in the early 90’s. With a flagging career and a penchant for taking forever to finish his work, the revenge thriller Oldboy seemed almost too easily commercial for the director to latch onto. If Lee had done something, anything, of interest with the material then I could maybe get behind an argument for this remake moving forward. Though the film does have some classic Lee elements on the technical side, it’s lacking the depth that he’s brought to his earlier efforts like Do the Right Thing and more recent work like documentaries surrounding the Hurricane Katrina disaster. His work in Oldboy winds up feeling like a director-for-hire and it permeates every level of the film. It’s a shame, then, that Josh Brolin (Labor Day, Men in Black III) is so good in the leading role of a man without scruples that’s abducted and held in confinement for twenty years by an unseen captor. It’s within these shoddy walls that he watches a television news report where he finds himself the number one suspect in his wife’s death. With his young daughter in foster care and his life seemingly over, there’s not much more for him to do but wait to die…until he awakes one day in a field, free. Or so it seems. Up until the man is released the film follows the original quite closely. It’s after Brolin is let loose that the film takes an approach that favors more explanation than necessary and less of the ominous mystery surrounding a menacing caller employed to good effect in the original. In Brolin’s quest for answers to why he was held, there’s still a plethora of well staged fight sequences with one of the central passages of the original being recreated, Spike Lee-style, with sweeping cranes that allow little to no cuts in action. The violence is way more visceral in the remake and that’s where Lee lets down the film a bit. It’s as if Lee needed to justify Brolin’s revenge by allowing him to enact sadistic acts of violence toward anyone/everyone that may have been involved only remotely. That didn’t work for me…especially when Brolin is cutting sliver sized chunks of flesh from the neck of an Oscar nominated actor in a wacky cameo role. A Florence Nightgale-like nurse played by a sleepy-looking Elizabeth Olsen (Silent House) is an unlikely ally for Brolin and her involvement with him never makes a whole lot of sense. He’s bad news and she can tell but either she loves a charity case or chunks of her storyline were excised in order to speed the film along. (Side note: the 105 minute film was cut down from a reported three hours, perhaps a director’s cut will give the film more shape). Sharlto Copley’s role is one I can’t go into much detail on but Copley (Elysium, Europa Report) winds up doing a great disservice with a cartoony performance in what could have been a much more engaging role. Screenwriter Mark Protosevich gets points for largely keeping this remake in alignment with the events of the original film…including its controversial dénouement. I’d also say that while the ending winds up looking poles apart than its inspiration, what Protosevich lands on could arguably be called the very same ending just under different circumstances. If you’ve never seen the original film Oldboy is based on, I’d guess you’d find yourself mostly engaged in this revenge crime drama which, faults aside, is quite well made and executed. Fans of the original also shouldn’t be concerned that their precious film has been tarnished nor should they riot at some of the changes employed here. Still…it’s a remake that didn’t need to happen.